Melbourne City Councillors call on the City administration to reinstate publication of the City Council’s Interstate and Overseas Travel Register. Melbourne City council’s Finance and Corporate Performance committee voted unanimously for the resolution put forward by Councillor Brian Shanahan for the City of Melbourne to reinstate the publication of City Council’s Travel Register. The meeting was attended by all councillors. Under the current terms of reference the City of Melbourne’s Finance and Corporate Services committee can not resolve or act under delegation any issues related to the City Council’s Governance. All decisions on Governance must be determined by resolution of the full council. Previously the Finance committee was able to consider and make direct requests on governance issues. The City Council administration snuck in the changes to the terms of reference of the Finance Committee, at the first meeting of the newly elected Council, removing the direct say and involvement of the committee in the governance of the Council. Update: (Dec 1, 2005) Unconfirmed minutes of the Melbourne City Council’s Finance and Corporate Performance (sic) committee have been published. We will have to wait to see the recipe for the pudding before we bring out the plates. The Travel Register records all staff and councillor overseas and interstate travel and is required to be maintained by the City Council under regulation 11 of the Local Government (General) Regulations 2004. The Travel register is a public document and was previously published and available on the Council’s web site but removed, without consent or authority by the elected council, in what is considered a cynical move by the Council administration in seeking to avoid disclosure and accountability. The City Council administration have previously acted to avoid publication and accountability for staff travel and we believe they will continue to do so. Whilst this is a good sign and perceived victory for the push for honest open and transparent governance we will not be celebrating until we see the proof of the pudding. The silly season in the lead-up to the Christmas and New-Year break is upon us and anything can happen. Our sources in the City Council Governance Department say that Ms Allison Lyon, Council legal officer, sought to sidetrack the resolve of the Council Committee by making specious claims that the publication of Council’s Travel Register would breach privacy entitlement of Council staff and possible be in beach of staff’s employment contracts. Allison Lyons has spent thousands of dollars of limited Council resources in her on going attempt to avoid open disclosure of this information and public accountability. The Travel Register is a public document required by regulation to be accessible and open to the public. The information recorded on the Travel Register is not private information. 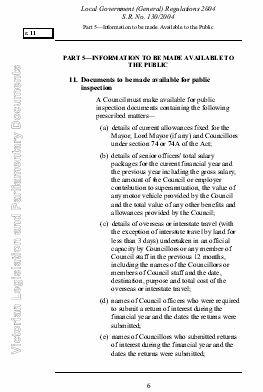 It is the detailed costs to ratepayers associated with Councillor and staff interstate and overseas travel. All staff employment contracts are, supposedly, in accordance and fulfilment of the requirements outline in the Victorian Local Government Act and its regulation. Given that the City of Melbourne has a large number of interstate and overseas investors with a stake-holder interest in the City of Melbourne, access to this information via the internet is in accordance with good governance practices. It is the most effective and efficient means of communication. This is not the first time Ms Lyons has sort to spend ratepayers information seeking to prevent access to public documents. In 1999-2001 Ms Lyon wasted over $60,000.00 of ratepayers’ money trying to prevent the publication of detailed results of the Melbourne City Council elections. The Victorian Civil Administrative Tribunal headed by Senior Member Mr McNamara, in determination of an application made under Freedom of Information Act ordered the City Council to provide access to the detailed elections results without reserving his decision. The outcome of this case was obvious to everyone but Ms Lyons and the Council’s Governance department. The fact that the decision was made without reservation immediately after the closing statement by the City Council’s legal representative indicated the poor quality judgement and professional advice given to the City Council at the time. Melbourne City Councillors have express concern at the decision of the administration to withdraw from publication the Council’s official Travel Register. The Travel Register records the cost of each interstate and overseas travel undertaken by staff and councillors and is required to be be maintained under the provisions of the Local Government (Genral) Regulations 2004 (r11). It is a public document so why is it not on the Council’s Internet site? What are the staff trying to hide? Obvious! The extent and cost of staff travelling interstate and overseas at ratepayers expense. This register was previously published on the Council’s Internet site but was quickly withdrawn and hidden from view following the election of a new Council. Melbourne City Councillors were not consulted or asked if the Travel Register should be withdrawn. The administration acted on their own volition. The City council has come under intense pressure to reinstate the publication of the Travel register and ensure it is maintained and kept up to date. The public have a right to know and the Internet is the best way to ensure that this information is made available. It is still unclear if this issue will be raised at tomorrows Finance and Corporate Performance (sic) committee meeting tomorrow (Tuesday Nov 29). Letters requesting the Council to list and consider this issue were sent to the City Council weeks in advance of the meeting but the administration have failed to include it on the meeting as published agenda. This raised on going concern as to the professionalism of the Council’s Governance department and whether they have acted in good faith by not listed it on the agenda for tomorrow nights committee meeting. The Council administration it appears will go to any length to avoid publication and accountability. We wait with interest to see what transpires at the meeting tomorrow. Keep am eye on Alison Lyon’s, Council Legal Officer, to see what arguments she comes up with to try and avoid publication. Alison Lyons has come under ongoing criticism for her advice and questionable actions in the past. Hopefully the Council will act and not have the wool pulled over them by Ms Lyon once more. We will be watching with interest and will certainly report on the outcome of this meeting as soon as we can. John Vogel’s, State opposition spokesperson for Local Government, comments advocating a “first-past-the-post” voting system (Herald Sun Nov 28) demonstrates his inability to understand the mechanics and principles of Australia’s democratic elections. First-past-the-post elections are not the solution to the perceived problem of “dummy” candidates, they will always exist, genuine or not. Under a first-past-the-post election a candidate can be elected with less then 35% of the vote, as was the case with George Bush’s election in 2000, the only requirement being that they have the highest minoity number of votes as opposed to a majority. Give me a majority elected candidate over a minority supported candidate any day. Democracy is not perfect but it is the best system we have. Australia should stand proud of its preferential voting system and not pander to the ill informed. Other Countries such as England, The United States Canada and Ukraine would be better off if they adopted our preferential voting system. This explains why the City of Melbourne Councillors have been silent in not wanting to disclose the true figure and costs of Council interstate and overseas travel. They have been bought. Seduced by the dark-side of local government administration. “You scratch my back and I will scratch yours”. Shame on you all for not defending the right for the public to know and being compliant in a cover-up of avoidance. You can run, you can fly but you will be held to account. We have FoI the City of Melbourne and as soon as they respond we will publish what they wont. the Council’s travel register showing the full cost of travel including staff travel. The Council failing to publish the Travel register on the internet and instead requiring copies of the data to be obtained only through FoI is an abuse of process. Something that may interest the Ombudsman, We will wait and see how quick they respond to our FoI request before lodging yet again another complaint to the State Ombudsman. It turned out that over $8,000 was unaccounted for and some of the expenses for our Councillors were pickup and put on the staff, who accompanied our globe trotting Councillors, corporate tab account thus reducing the amount disclosed on the Councillor expense report. – Creative really, no wonder we pay them so much with talents like this. Green’s Councillor Frazer Brindley has proven he is not as Green as his predecessor David Risstrom. David Risstrom was the most travelled of the previous Council having talked the City Council into funding the costs associated with his executive responsibilities of a International environment group. To David’s credit he flew economy and stayed in cheap accommodation limiting the burden on the poor ratepayer. Not so for Cr Brindley. According to the Herald-Sun report Cr Brindley is seeking approval for $9,000 to cover the costs of a proposed seven day African safari trip to Cape Town to attend an ICLEI conference. Cr Brindley said “the council only approved trips for councillors after serious consideration of benefits for Melbourne” If this is the case then why has Geoff Lalor, City Director of Sustainability applied for the sum of $9,000.00 to be set aside for this trip? Could this be another case of staff over-inflating the budget cost of Councillor’s overseas travel? Cr Brindley is an executive member of ICLEI and has managed to obtain approval from the Council to fund the costs of his international travel to attend executive meeting. ICLEI is a third party international environment group, which begs the answer to the question Why is the City of Melbourne expected to pick up the tab for the costs of a third party organisation’s executive expenses? Surely ICLEI should foot the bill for its own governance and not rely on the Melbourne Ratepayers? Was Cr Brindley appointed to the executive of ICELI on merit or because he could obtain funding from the City of Melbourne? We did not expect Melbourne to meet the executive costs of the MAV or VLGA? Cr Brindley‘s flight of compassion and care for the environment will generate over 2.88 tons of Co2 emissions. Well exceeding the average emissions generated for an individual over a whole year. If the City Council seriously considered these overseas bonus trips for Councillors then where are the reports and break down of the costs. Councillors the public have a right to know. Publish your report and share the benefits to the city that you claim exist. I am sure those who are struggling to pay off the interest rates on their mortgage would love to know why the rates in the city are so high and what benefit they derive from Councillors’ luxury holidays abroad. Question: Who collects the frequent flyer points and does the Council pay the Fringe Benefits Tax? Is it included in the expense statements? We are thinking of keeping a trip tally and as soon as we collate the data we will let you know. Whilst the Lord Mayor, John So, seeks advice from Victorian State Government – Local Government Minister, Candy Broad, about Cr Singer’s position, the Council puts on hold the fate of the off-key DLM Singer. It’s not a question of if Gary Singer has breached the Local Government Act as a result of his professional financial mismanagement, he has not, it is a question of good governance and confidence in his ability to remain as chairman of the City Council’s finance committee. It’s up to the elected Council to judge Singer’s performance, not Candy Broad. 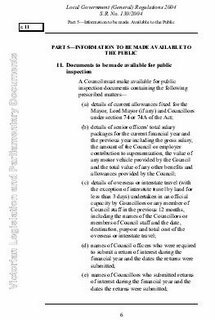 It is the elected Council that appointed him to it’s finance, audit and investment committees and it is their decision if he is allowed to continue in that role given he has now been found guilty of professional financial mismanagement. The question that needs to be ask is “what’s in the best interest of the City as a whole?” There is no doubt that Singer’s decline in his professional standing has brought the reputation of not only himself by also the City of Melbourne into question. The Melbourne City Council can not sack Cr Singer from his position of Deputy Lord Mayor. He was directly elected along with the Lord Mayor Cr John So. This is one of the identified problems associated with the direct-election model. But the Melbourne City Council can and should decide his fate as chairman of the Council’s Finance, Audit and Investment Committees. Already two City Councillors, Cr Peter Clark and Cr Faser Brindely, have spoken out and called for Singer to stand down and hand over his position of chairman of the Council’s Committees to his understudies. Committee chairmanship come-up for review next month marking the first-year anniversary of the current elected Council. New allegations of mismanagement in relation to superannuation payments, that have just emerged, bring in to further contention John So’s choice of his deputy and Cr. Singer’s suitability to remain in the Finance position. If John So and Cr Singer will not act to protect the reputation and interest of the City Council then the onus is on the City Council. They have an obligation, right and duty to act. The Council must now consider a vote of confidence in the Deputy Lord Mayor. This is not a question that can be left unaddressed by taking no-action, as is the normal practice of the City Council, doing nothing will not resolve the situation or instill public confidence in the Melbourne City Council’s administration and governance. Cr Singer must demonstrate that he has the full confidence of the City Council or resign.